The token increase in fuel prices isn’t enough to stem the flood of red on the balance sheets of state-owned oil marketers. Protests following the government’s recent decision to raise fuel prices have a curious element: other than the usual political suspects, not many have raised their voice of dissent. The move to raise the price of petrol by 11 per cent, diesel by 9 per cent and LPG (cylinders) by 17 per cent is seen as the boldest step taken by the present government so far. And the unprecedented maturity with which the price increase has been accepted by the common man reflects the gravity of the situation. Nevertheless, the hike merely covers less than 10 per cent of the losses of oil companies. Of the total under-recovery of oil marketing companies estimated at Rs 2,45,305 crore for 2008-09, the price increase will yield a mere Rs 21,000 crore. The vast difference highlights the sheer mismanagement of the petroleum economy. While the cut in duties is expected to yield a further Rs 22,660 crore, under the subsidy sharing formula designed by the government, upstream oil companies including the Oil & Natural Gas Corporation (ONGC), and GAIL are expected to pitch in with around Rs 45,000 crore. If one takes into account the oil bonds of over Rs 94,600 crore that the government will issue, which is a liability on the future, the companies will still have to absorb losses of around Rs 20,000 crore. For Hindustan Petroleum, which pegs its under-recoveries at Rs 52,000 crore a year, the price increase will help it net an additional Rs 8,000 crore in the next 10 months. The company saw its fourth quarter profits decline by 30 per cent to Rs 384.51 crore over the same period a year ago. Indian Oil has posted a net loss for the quarter ended March 31, 2008, of Rs 414.27 crore as against a net profit of Rs 1,502.69 crore during the corresponding period of the previous year. Despite the price rise, Indian Oil will continue to face a loss of Rs 16 per litre on petrol and Rs 28.50 on diesel. Sarthak Behuria, Chairman, Indian Oil, feels that given the present circumstances, this is the best that the government could have done. “We expect the measures to improve our liquidity considerably,” he says. The oil bonds that the government issues only theoretically address the wide deficit. That’s because the bonds cannot be used to import the required crude. The real constraint that the companies face is cash. To adjust to grim price realities, companies are doing the best they can, cutting corners wherever they can. They are reducing fuel inventories in order to cut daily working capital requirements, processing more sour crude oil, which is cheaper than sweet crude, increasing the capacity utilisation of the refineries, and seeking ways to borrow more funds. For IOC, the cost of importing crude oil has almost doubled to $6.2 million from $3.4 million per day last year. It has also halved fuel inventories to a week and is operating at almost full capacity today, compared to around 90 per cent last year. However, not everyone agrees that the blame for the crisis faced by PSU petroleum companies lies solely with the government. According to Kumar Manish, Associate Director, KPMG, the companies should not have been so aggressive with their retail rollout. Indian Oil alone has around 17,800 pumps, many of them located close to one another. “They could have easily foreseen the price movements and avoided getting into the mess,” he says. The government’s policies are also hitting companies hard by distorting fuel consumption patterns. Artificially administered prices have made diesel the fuel of choice for consumers. There has been a huge increase in its consumption over the last three years, exceeding 20 per cent per annum. Economist Omkar Goswami believes that there is a need to adjust demand to permanently high oil prices. The government is doing a great injustice by not passing on the burden to consumers. “By not allowing prices to ration demand, we are bankrupting three good companies,” he says. The policy has wreaked havoc on any attempt to move towards a free market. Private sector refiners like Reliance and Essar are exporting fuel because it is not viable to sell in the domestic market, since they get no subsidies. 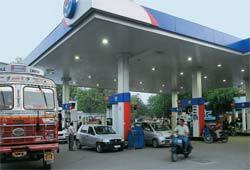 Reliance Petroleum has had to shut all its 1,432 pumps. Administered prices, then, represent one of the biggest distortions in the market today. “Removing subsidies will have a negative impact on the economy, but the implications of a large public deficit will be much more serious,” says Subir Gokarn, Chief Economist for Asia-Pacific, Standard & Poor’s. He believes that the present hike may be the first in a series of oil price increases. “While the move is not enough, it is at least a start,” he says. Whether the oil companies are able to escape their impending doom will depend on the government screwing up courage to free up oil prices.